Ancient pollen grains that were floating in the air when mammoths roamed Southern California are providing new insights into historic droughts in the region, including how a series of mega-droughts between about 27,500 and 25,500 years ago changed the ecological landscape. A new scientific paper tracks these changes and suggests that warm ocean conditions similar to what we see off Southern California today fueled that 2,000-year period of long, intense droughts. In the paper, paleoecologists Linda Heusser and Jonathan Nichols of Lamont-Doherty Earth Observatory analyzed pollen levels in a sediment core drilled from the bottom of Lake Elsinore, a climate-sensitive area in the eastern shadow of the Santa Ana Mountains near Los Angeles. The pollen levels show how pine trees and juniper that had dominated the ecosystem 32,000 years ago gave way to a massive influx of dryland herbs, shrubs and chaparral about 27,500 years ago, suggesting that the climate grew more arid and the lake dried up. For 2,000 years, the climate fluctuated, but the pollen levels show that it never stayed cool and wet long enough during that period for the trees to reestablish themselves along the lakeside. Then, around 25,200 years ago, pine trees and junipers began to dominate the Lake Elsinore pollen record again. The scientists’ high-resolution pollen analysis provides the first continuous terrestrial record at a scale of decades rather than centuries of ecological change in coastal Southern California during the last glacial period, about 32,000 to 9,000 years ago. Heusser and Nichols also found that the terrestrial changes in that pollen record correlate with records from ocean sediment cores that show that the Pacific Ocean just off Santa Barbara was warm during the same periods of drought, pointing to a likely driver of the mega-droughts. A warmer ocean affects the winds along the coast, causing them to blow from the land toward the ocean rather than from the ocean, where the wind could bring moisture to the land. The moisture that did make it onshore during the mega-droughts was likely blocked by the mountains, and very little reached the Lake Elsinore Basin. The ocean temperature off Southern California during the mega-droughts was similar to recent temperatures, but the background is different, Nichols and Heusser explained. 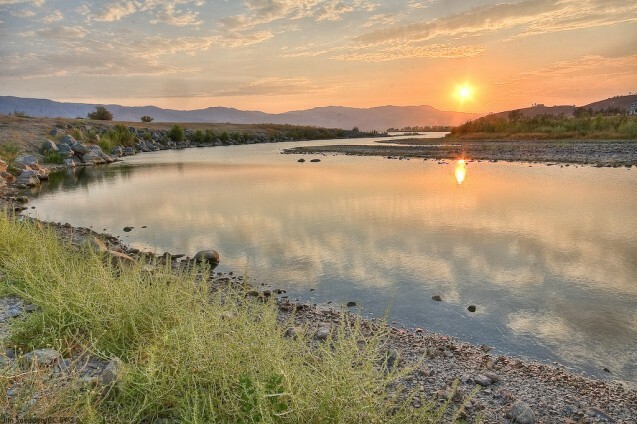 Today, the climate is drier and warmer, and human-induced global warming is exacerbating drought conditions, as described in a recent study from Lamont’s Park Williams and Richard Seager. California has also seen regular swings in modern times from periods of drought to El Niño years. “This was happening during a glacial period when it was already cool and wet – cooler and wetter than it is now. If we got a drought like this now, it would be putting a big drought on top of a time which is already warm and dry,” Nichols said. During the mega-droughts, the pollen record from Lake Elsinore suggests that the pine trees and juniper at lower elevations around the lake died off and their tree line moved up the mountains to cooler temperatures, while the lake dried out and its bed filled in with herbs and scrub, Heusser said. Heusser, Nichols and coauthor Matthew Kirby of California State University, Fullerton, published their findings in the October issue of Quaternary Science Reviews.